This first biography of the man who launched the self-help phenomenon is a reflection on themes of success and failure, individual and society, moral and material worth. Both before and after the sensational success of Self-Help, his output was vast, as newspaper editor, periodical journalist, and author of many biographies. John Hunter, born in Northern Ireland, was awarded a degree in history and political science at Trinity College, Dublin. After a successful career in the communications industry and in manufacturing, he studied at Birkbeck College, London, taking an MA in Victorian Studies. 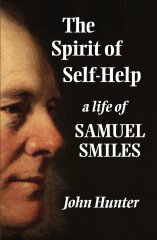 The Spirit of Self-Help is his first book. Thoughtful, clear and readable. Readdresses one of the most successful writers and thinkers of the Victorian age and makes him relevant today. A magnificent book. Highly recommended. Highly informative. A great read.